This year the West Lancashire Yacht Club 24 Hour Race will provide live GPS tracking of each competing dinghy. 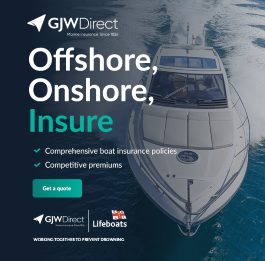 WLYC have agreed a joint exclusive sponsorship deal with GJW Direct, Allen Brothers and Precision Yacht Paint, to provide the SailRacer GPS Tracking System. Throughout the 24 hours competitors, team management, spectators and supporters will be able to view / follow the progress of all the dinghies online via the event website. It doesn't matter where the viewers are they can follow everyone or just a few select teams. They could watch: in the team tent, in the WLYC bar, back at their Sailing Club or even in a restaurant in Hong Kong! All each viewer needs is access to the Internet. Each Dinghy will have a GPS tracker attached, and the SailRacer software will provide a wealth of detailed analytics such as lap times, speeds and VMG. The teams will have a valuable tool allowing a direct comparison across all competitors to help them understand their overall performance, not just their strengths but also where they can improve. A powerful management tool! However, be aware it is not the event scoring system, WLYC will maintain its own scoring system developed over many years; it does not rely on the SailRacer data. For the Race organisers, the GPS tracking system will enable a constant monitor of the positions of all boats, particularly important during the hours of darkness or poor weather. WLYC website www.wlyc.org.uk//24-hour-race drop down menu or via a prominent SailRacer button by the 24 Hour Race icon on the right column. Alternatively, via the SailRacer website. So for the Sailors, Supporters and Race Managers (& Techies) what will SailRacer do at the 24 Hour Race? Small battery powered units are attached to each boat. Using GPS these accurately record each boat's position, approximately every 15 secs and then data uploaded to a cloud server via a mobile data connection using the onboard SIM card. The GPS positional data is then stored in a vast online database, tagged by boat and race. The tracker player provides a Bird's Eye view of the race, allowing online spectators to follow the action in near real time, via mobile phones, tablets and computers. For the sailors there is the chance to watch the races in replay mode, learning where the race was won and lost, a great coaching tool. For race organisers & management, the SailRacer GPS tracking system provides a vital safety aid, acting as a virtual eye in the sky, monitoring the position of all boats. Please remember for this year’s WLYC 24 HR Race Sail Racer is not the event scoring system; however it is a valuable Race / Team Management tool, plus a viewing aid for supporters and spectators.